The purpose of our club is to unite and organize tall men and women for the purpose of their mutual benefit, to provide opportunities for cultivation of friends and common interests, and to sponsor activities for the promotion of cultural and social improvements. 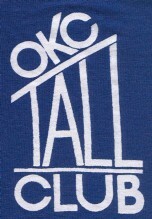 The OKC Tall Club is part of Tall Clubs International which currently has 39 clubs nationwide and connections to other Tall Clubs elsewhere in the world. There are many opportunities for meeting TALL people. Many clubs sponsor weekends which are a lot of fun and not very expensive - at some of these, you will find yourself among well over 100 tall people. Our monthly business meeting is held on the 2nd Wednesday of the month unless otherwise noted in the calendar. For more information, please see CALENDAR information below, or e-mail us. TCI Scholarships - Email Scholarship coordinator at gdjands@sbcglobal.net for details. Our social event planner is our long-time member Debbie Treat. Requirements for membership in the OKC Tall Club: Men must be at least 6'2" tall and women must be at least 5'10" tall as measured in stocking feet. You must also be at least 21 years of age. Annual dues are $15 for single members or $20 per married couple. We welcome new members to fill out a membership application and include $6.25 dues for a 3-month probationary membership period, during which they must attend at least 3 events (including at least 1 work function such as a business meeting) and are then eligible to be voted into full membership at the end of the 3-month period. If you are interested in meeting other TALL people, just come see us at one ofour events. If you would like more information or you would like to become a prospective member, please email us with the information requested below. One of our members will be happy to call or email you and tell you about our club. NOTE: Our monthly business meeting is usually held on the second Thursday of each month, and the location is called out in the monthly calendar. Please don't forget to check the calendar below for details about the happenings for this month. YOU ARE INVITED!! Just come on out and look for the tall people. If you let us know you are coming we will keep an eye out for you!! & Any additional questions or comments you might have. Wednesday, June 10 6:00 p.m. Business Meeting. NEW LOCATION - Macky McNear’s Steakhouse 1201 South Meridian AveOKC, OK 73108-1705. Thursday, June 11 Happy Birthday Peggy!!! Saturday, June 13 Happy Birthday Nancy!!! Sunday, June 21 Happy Father’s Day!! Wednesday, July 8 6:00 p.m. NEW LOCATION—Business Meeting. Mackie McNear’s, 1201 South Meridian Ave OKC, OK 73108-1705. Saturday, July 18 5 p.m.—Roller Derby, Centenial Bldg, State Fair Park, Oklahoma City, OK—This is a Oklahoma Victory Dolls Roller Derby double header!